In 1925, the National Park Service – or more correctly, the Yellowstone Park Transportation Company (which I guess was a private company and had nothing to do with the Park Service, my bad), purchased 90 of these White Model 14-45 Touring Buses with coachwork by Bender. Your average car couldn’t traverse the rough terrain of a giant park like Yellowstone in the 1920s. So you’d hop aboard one of these more rugged vehicles that would take you to see everything you came to see. At one point in time, there were hundreds of buses that carried visitors throughout the park. This is one of only a few that survive and it’s “likely the finest restored example.” It is indeed impressive. These open-air coaches were replaced in 1939 by the closed variety, and they were sold off. The 11-passenger convertible bus is powered by a 3.7-liter straight four making 45 horsepower. The restoration began 15 years ago and turned out beautifully, as you can see. You’ll probably never have the opportunity to buy one of these again. The estimate is $110,000-$130,000. Click here for more info. And here for more from Gooding. Update: Not sold as the vehicle was withdrawn from the sale. Update II: Sold, RM Sotheby’s, Hershey 2016 $88,000. 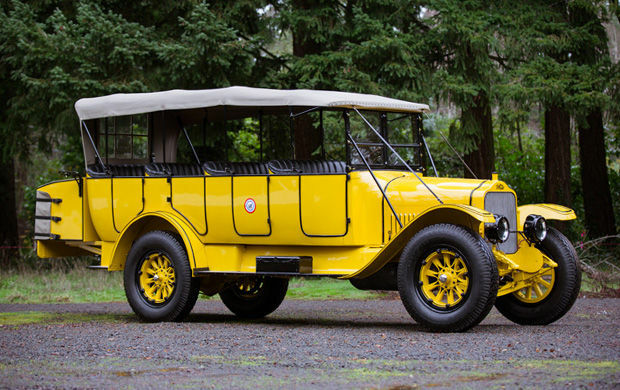 This entry was posted in Uncategorized and tagged 1925, auctions, bender, bus, cars, classic cars, gooding & co, model 14-45, touring bus, white, yellowstone park by classiccarweekly. Bookmark the permalink. We own a 1925 restored White Yellowstone touring bus, Trying to see what the canopy lays on the front windshield.